In a Nutshell: Franklin Mint Federal Credit Union (FMFCU) has teamed up with Berenstain Enterprises to develop The Berenstain Bears Financial Literacy Program, designed to teach kids the basics of money management. FMFCU designed and built Bear Country Credit Union — an interactive space where kids can experience the credit union straight out of “The Berenstain Bears Visit the Credit Union,” a book FMFCU commissioned Mike Berenstain to write. There, kids from kindergarten through third grade learn how a credit union works and what it means to Save, Share, Spend, Earn, the money management concept carried throughout the program. Credit Union Network for Financial Literacy (CUNFL) is a wholly-owned CUSO formed by FMFCU to make The Berenstain Bears Financial Literacy Program available to credit unions around the country, which currently includes 14 credit unions in 13 states. Franklin Mint Federal Credit Union (FMFCU) teamed up with Berenstain Enterprises to develop the Berenstain Bears Financial Literacy Program, an educational and marketing suite that teaches kids the basics of money management. The innovative idea to use The Berestain Bears to introduce children to banking came from former FMFCU President and CEO John Unangst, who saw value in branding with trusted children’s characters. Kids explore Bear Country Credit Union, a field trip destination hosted by Franklin Mint Federal Credit Union. Franklin Mint Federal Credit Union developed Bear Country Credit Union to be a financial literacy center for kids. It opened in 2013 as a 1,100-square-foot mock branch office and is connected to one of the credit union’s larger branch locations. So, what can kids expect to see at Bear Country Credit Union? To start, they’ll find a detailed recreation of some of the illustrations in the book, including a giant tree in the middle of the space reminiscent of the one the Berenstain Bears live in. Children will also find interactive games and exhibits, including tunnels to crawl through and explore, and many hands-on activities. And, because this elaborate space is designed to teach kids about the inner workings of a credit union, there are plenty of expected features, too. There are teller windows with microphones, a vacuum-tube system for sending “money” or messages, a member services counter, and a coin-sorting machine called the Honey Pot. Stan and Jan Berenstain wrote the first Berenstain Bears book, “The Big Honey Hunt,” in 1962. Since then, generations of children around the world have grown up learning valuable lessons with the bear family. 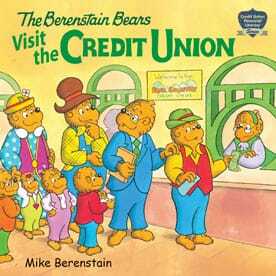 Those lessons continue with “The Berenstain Bears Visit the Credit Union,” a book written exclusively for FMFCU by Mike Berenstain, son of the original authors. From the beginning, the Berenstains wanted their books to teach kids about the real world in a way that was fun and easy to understand. Today more than 300 Berenstain Bears books cover a variety of topics, from visiting the dentist to bullying to learning about how banks work, and that have been translated into 23 languages. The classic title “The Berenstain Bears Trouble With Money” led to the relationship between FMFCU and Berenstain Enterprises. “Before we commissioned Mike Berenstain to write ‘Visit the Credit Union,’ we were using ‘Trouble With Money,’ which was originally published in 1983,” Ranalli said. Mike Berenstain had not previously written an industry-specific book, but, because of the Berenstain’s commitment to education, he agreed to do this one. That was the beginning of the relationship between Berenstain Enterprises and FMFCU, and it ultimately led to the Berenstain Bears Financial Literacy Program, which is run by CUNFL and available exclusively to credit unions. Thanks to this partnership and the creation of CUNFL, partnered credit unions are able to use the beloved characters to teach kids about healthy money habits as well as the benefits of credit union membership. “We’re very big on literacy, both financial and reading, here at Franklin Mint,” Ranalli said. Once the relationship was established and licensing rights were granted, the next step was to design a hands-on learning space for kids to experience a credit union first-hand. Bear Country Credit Union fit the bill by representing both the integrity of the Berenstain Bears brand and the function of an actual credit union. So the school children who visit Bear Country Credit Union on a field trip of their own are quite literally stepping into the story. They learn about credit union products and services, how to open a savings account, and about healthy saving, sharing, spending, and earning money habits — just like the Berenstain cubs in the book. All of the activities are designed to give kids an appreciation for money and an understanding of how a credit union fits into the picture. At Bear Country Credit Union, kids receive a passport that guides them through various stations, including a teller window, where they roleplay using Bear Country Credit Union money, deposit slips, a pneumatic tube and working microphone. The large tree house in the center is known as the Mint station. With tunnel access on one side, and a wide opening on the other, the Mint station is made up of financial activities inside and out, such as piggy bank pinball, a coin sorter, a coin rub, and a cove for coloring pretend dollar bills. Children also roleplay as member service representatives and the branch manager before visiting the vault, where they create a list of valuable items and tuck it away for safekeeping. The Cub Account is FMFCU’s youth savings account, which is available to children up to 10 years of age. By opening a Cub Account, kids get a free piggy bank, their own free copy of “The Berenstain Bears Trouble With Money,” and a one-time match of up to $10 when they deposit what they’ve saved in their piggy bank. Parents of Cub Account holders can even get $25 when they open an account, too. The Berenstain Bears Financial Literacy Program was made available to other credit unions in 2015, the same year “The Berenstain Bears Visit the Credit Union” was released. In 2016, the program was endorsed by The National Credit Union Foundation. Since 2015, 13 credit unions across the country have joined FMFCU as licensed members of the program. For credit unions that want to participate, CUNFL provides everything needed to get started. Credit unions receive rights to the program and product literature, school lesson plans, and even gain access to Berenstain Bears costumes for promotional events and usage of logos and other marketing material. “Most credit unions are already doing some sort of financial education, it’s just a matter of finding the ones that want to start with youth,” Ranalli said. There are very few financial literacy programs out there that can lay claim to the type of trust and name recognition that comes with a beloved children’s book series like the Berenstain Bears. Thanks to the vision of Franklin Mint Federal Credit Union and the commitment of Berenstain Enterprises, this unique program has helped bring financial literacy to tens of thousands of school kids.